Fun and functional. Decorative and decadent. 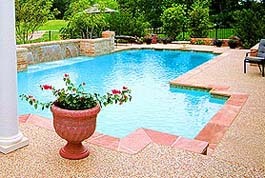 Your options are virtually unlimited once you decide to make your poolscape dreams a reality. Whether you’re designing a new pool or upgrading your existing backyard environment, we work closely with you to create an outdoor living area perfectly suited to fit your lifestyle. Explore your options. Call Indian River Pools today! Step outside your backdoor into a private paradise – alive with the sounds of cascading waterfalls and rippling crystal blue water set in a backdrop of brilliantly colored flowers and lush foliage. Immersed in your warm, tranquil oasis, you have the discretion to change any aspect of your environment right at your fingertips. Make the paradise of your dreams a backyard reality. Call us today. Make your own signature splash in a custom-designed poolscape. Whether you prefer spiking the winning point in a game of pool volleyball or simply letting a drop of water roll off the end of your toes as you relax on the sidelines, we can make the pool of your dreams a backyard reality. Call us today to find out more. Indian River Pools (772)589-5535.